The new Strike TB 105-115 tractors are perfect for olive groves, low density fruit orchards and tunnel greenhouses. Not only is this new series of tractors more powerful, with new FARMotion offered with outputs from 102 to 113 HP, it is also safer than ever, with new brake systems for the tractor and the trailer which both comply with the most stringent safety legislation. The new Strike TB 105-115 family offers an extraordinary choice of transmission and PTO configurations to cater perfectly for the needs of any farm. Unmistakeable style with power and grace. 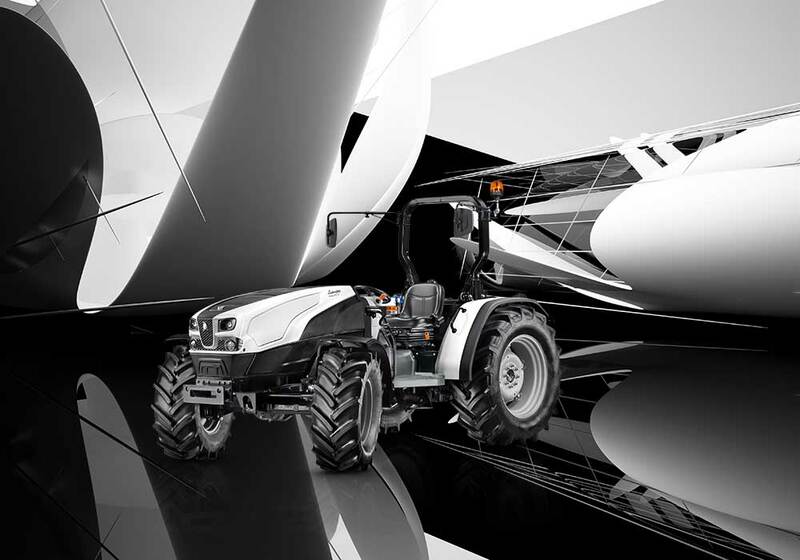 Boasting an exclusive design in keeping with the distinctive style of the Lamborghini family and class-beating performance and efficiency in all working conditions, Strike TB tractors stand head and shoulders above their rivals in this segment. New FARMotion Stage III B engines: born for farming. The FARMotion engines powering the Strike TB family were specifically designed for use in agricultural applications and feature state of the art solutions such as common rail injection, turbo forced induction with intercooler and wastegate and a viscostatic fan. These engines attain Stage III B emissions compliance with just a DOC catalytic converter. The FARMotion engine has a maximum engine speed of just 2,200 rpm, with maximum power available at 2,000 rpm, and a practically flat torque curve across a broad range of engine speeds. Sturdy, efficient and highly configurable. The basic configuration, with a 5 speed synchronised mechanical gearbox with two ranges and a synchronised reverse shuttle, offers 10+10 speeds. Adding the optional creeper gear or Hi-Lo gearbox increases the choice of ratios available to 20+20, while adding both options offers a total of 40+40 speeds. A hydraulic reverse shuttle, with the Stop&Go function and ComfortClutch button, is also available as an option. This wide choice of configurations, combined with the range of tyre sizes available (with tyres from 24" to 30" usable for the rear wheels), mean that these transmissions can also offer a top speed of 40 km/h attainable at engine speeds below 2,000 rpm. The hydraulic system is fed by a 55 l/min pump which, in addition the lift, also delivers oil to 4 couplers with mechanically controlled distributors (or 6, as an option). A supplementary pump with an impressive capacity of 35 l/min is dedicated to the steering system, and also features the SDD (Steering Double Displacement) function, which doubles the steering rate. The rear lift has a maximum capacity of 3,600 kg (or 4,525 kg as an option), while the optional front lift has a capacity of up to 2,100 kg. Unrivalled PTO versatility: all four universal speed modes (540 + 540 ECO + 1000 + 1000 ECO) are standard, while a ground speed PTO, synchronised with the transmission and with independent output shaft, and a front PTO are available as options. Comfortable and functional. Extraordinarily simple controls. The layout of the driver zone has been completely redesigned and features simple, intuitive and even more rationally organised controls with the widely acclaimed Lamborghini colour-coded scheme. The platform is suspended on silent-blocks for even greater comfort, while the dashboard features a practical analogue-digital instrument giving the driver all the information needed on the status and functions of the tractor. The choice of structures available to protect the driver in the event of a roll-over consists of two 2-pillar rear frames, with partially or completely folding variants, or an all-new folding 2-pillar front frame.